I am writing to thank you and your firm for the excellent service I have received over the last year. Thanks again Rob for sending one of your guys so quickly. We can't quite believe what a great service we keep getting from you. Dear Handyman Express, I simply wanted to say thanks for fixing up our lights! When you're planning to install new kitchen units in the heart of your home you deserve to have a kitchen any TV chef would be proud of. The carpenters from Handyman Express have a wealth of knowledge and can swiftly install the units you want. 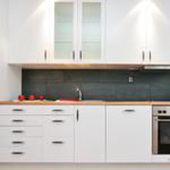 We can supply a vast range of kitchen units, depending on your budget and install them professionally and expertly. Trying to undertake this task yourself can result in ill-fitting doors and uneven work surfaces, but not with our crew of professional kitchen fitters on the job. Our honest and trustworthy services have gained an enviable reputation and our quality of service keeps us head and shoulders above the competition. We have the expertise to fit table tops, dressers, cupboards and countertops, in fact, every aspect of your kitchen installation. We always look forward to hearing from new customers and seeing their smiles when they see what we can do. Our well-trained, experienced and skilled tradesmen will ensure your cupboard doors shut tightly, the shelves inside are leveled and any appliances can be slotted in with ease. Fitting kitchen units is not always easy especially if you don't have the right tools. All our carpenters are well equipped not just with tools and equipment but with the relevant knowledge too.